In the last two decades noncoding RNAs have been the recipients of increasing scientific interest. 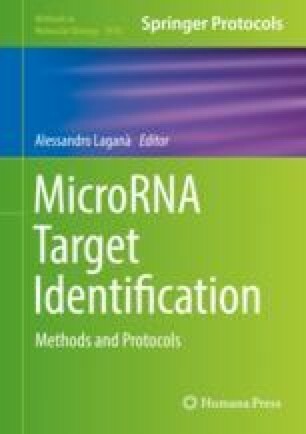 In particular, miRNAs, short (~22 nts) noncoding transcripts, have been thoroughly investigated since their essential role in posttranscriptional gene expression regulation had been established in the early 2000s. With the advent and the advancements of high-throughput sequencing technologies in recent years, long noncoding RNAs have also started to emerge as important actors in cellular functions and processes. Such transcripts, on average longer than 200 nt, whose functions have yet to be fully characterized, have recently been identified as regulatory elements of the RNAi pathway, harboring several miRNA response elements, uncovering the phenomena of competing endogenous RNAs (ceRNAs), or “sponge RNAs.” The present chapter aims to provide a brief update on the actual biomedical relevance of ceRNAs, together with a summary of resources, tools, and practical examples of their application to aid researchers in the discovery and further elucidation of lncRNA–miRNA interactions.